As industry leaders, Dallas Podiatry Works is proud to offer on-site design and creation of your custom-molded ankle brace or foot brace. Our latest product, the Bongiovanni brace, is a hybrid design made of pressure-sensitive materials that absorb shock and offer stability to your foot and ankle. 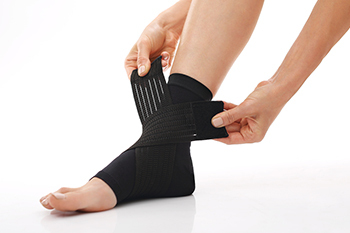 Dallas Podiatry Works is an industry-leader in ankle braces and foot braces in Dallas, TX. The first step in creating your custom-molded foot brace or ankle brace is to see one of our expert Dallas podiatrists for an evaluation. This evaluation will determine the appropriate device for your foot or ankle condition. Once we agree upon the best treatment for your needs, we’ll take an impression of your foot and/or ankle to create a brace that’s perfect for your needs. Available in two colors, black and beige, this brace is made using a thin polypropylene shell encompassed by a closure system. The closure system is made of X-static material on the interior and calf-skin leather on the exterior. These materials work together to provide both a comfortable and durable brace. Used primarily as support for those with foot drop, this cutting-edge brace is both lightweight and strong. Stabilizing forces are used to prevent foot drop deformity, plus thin design allows for an easy shoe fit. Using a revolutionary fabrication process, this brace molds to the contour of the foot and provides both stabilizing control and shock absorption. The device is built around a soft polyurethane footbed system, made of innovative material imported from Nora, Germany. This material contains silver, which prevents bacteria growth and helps with proper foot hygiene. It’s also made using Nora Lunatec Combi, which is a revolutionary product developed using composite sheets that are “vulcanized” during the manufacturing process for secure strength with any bonding. Call to Learn More About Custom-Molded Ankle Braces or Foot Braces in Dallas, TX, Today! To learn more about our custom-molded ankle braces or foot braces in Dallas, TX, call 972.566.7474. To schedule an appointment online, click here. We look forward to helping you get back on your feet!